Savory ham, asparagus and cheese are the perfect combination for your next brunch! Bursting with flavor, your friends and family won’t be able to resist! 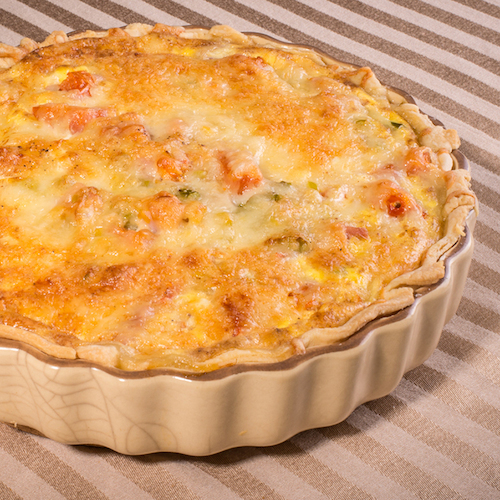 Using a 10in quiche pan, prepare the pie crust according to instructions for a one-crust pie. Trim excess dough and refrigerate. Sauté leeks and asparagus in butter over medium-low heat until tender. Reduce heat to low. Add ham and cook mixture until heated through. Remove skillet from heat and stir in tomatoes. In a separate bowl, combine eggs, half & half, nutmeg and hot sauce. Place vegetable and ham mixture into prepared pie crust. Add cheese and pour egg mixture over ingredients. Bake at 375° for 45 to 55 minutes.